Responding to requests from local industry, the Composites Innovation Centre (CIC) teamed up with Red River College (RRC), a local technical college, to investigate developing targeted composites manufacturing training programs. Training of composite technicians is not new to RRC who already deliver extensive programs to Manitoba’s aerospace companies. The focus of this initiative was to develop comprehensive training programs that could be used in industry as well as being rolled into core curriculum at the college. A modular approach was taken separating the training into the following areas; mould maintenance, gel coat spraying, open mould laminating, part trimming, resin infusion and mould making. With the CIC providing technical content, curriculum development specialists from RRC created the 5 modules. To evaluate their effectiveness, a pilot training program was delivered to employees from several Manitoba companies. The feed back was very positive. 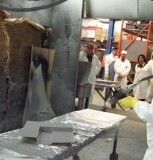 ‘This type of training is just what we need”, stated Doug Michie, General Manager of Frank Fair Industries, ‘it provides a very good orientation balancing theory with hands on activities that rapidly bring new employees up to speed in being able to manufacture composite components for our over the road coaches”. Efforts are continuing to develop the infrastructure necessary to properly deliver these programs for industry. Further information can be obtained from Boyd Koldingness, RRC’s Corporate Training Manager; Telephone (204) 632 3978, via email: bkoldingnes@rrc.mb.ca. Funding for this project was provided by the Province of Manitoba through the Department of Competitiveness, Training and Trade. 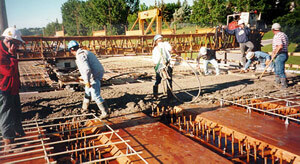 Over the past six months, CIC and ISIS Canada have been working together, with support from MIT (Manitoba Infrastructure and Transportation), City of Winnipeg and the local civil industry, to form a Special Interest Group (SIG) whose aim is to increase the use and awareness of composite reinforcement for concrete structures. The first event organized by the SIG was a Life Cycle Engineering and Costing (LCE&C) workshop held in Winnipeg on December 10th, 2009. Dr. Paul Christensen and Dr. Gamil Tadros presented a LCE&C model developed by the University of Saskatchewan, and then held an interactive session with attendees by inputting live data to the model. This event was attended by close to 30 representatives from across the civil industry, both within Manitoba and outside the Province, and was very well received. The workshop highlighted the benefits of using composites as reinforcement for concrete when considering the life cycle of a structure, and how the LCE&C model presented could be used in the early stages of design to help reduce the overall costs of infrastructure projects. This is considered to be of increasing importance in years to come as owners look to build more sustainable structures. Also, with the expected growth in P3s (Public Private Partnerships), all stakeholders, from design through to implementation and maintenance, have a vested interest in building longer lasting, more reliable structures. Walter Saltzberg (ISIS Canada) and Ruth Eden (MIT) concluded the workshop with reinforcing the message that composites were a necessary part of modern civil infrastructure and that industry should prepare for the increased role that composites will play in the future. Ruth Eden also stated that MIT would now be including LCE&C analysis as part of the normal bid process for future civil infrastructure projects. The next stage of the civil SIG is to build on the information and feedback provided by industry so far, and to determine how best to transfer composites knowledge to industry, complimenting the work ISIS Canada is doing in this area. The next Civil SIG meeting will be held on February 18th 2009, where further SIG activities will be determined. If you are interested in attending this meeting, or being a part of future Civil SIG activities, please contact Will Darracott at 204 262 3400 x208, wdarracott@compositesinnovation.ca.